Gilson Graphics’ President, Dave Gilson, recalls a defining event that led to his cutting ties with traditional banks in favor of Lake Michigan Credit Union’s commercial lending division. It’s that kind of responsiveness that has Gilson Graphics smiling and well-poised for future growth and success. 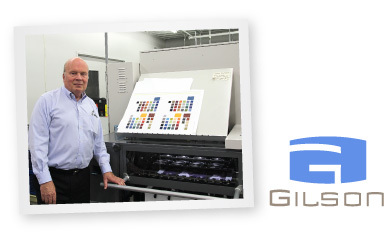 Gilson Graphics is a family owned and operated commercial printing business based in Grand Rapids, MI. Founded in 1948 by Lars Gilson, their success has often been keyed to growth by acquisition, in which commercial lending plays an important role. With current gross annual revenues of some $25 million and a staff of 165, Gilson Graphics operates out of two locations in the Grand Rapids area, as well as a composition facility in Atlantic, IA. Additional subsidiaries include North Star Teacher Resources and Ignition New Media Workshop providing classroom decorative, marketing services and website and e-mail products, respectively. Gilson concludes, "Lake Michigan Credit Union has been extremely responsive and flexible in meeting the unique challenges and needs we experience in our ever-changing industry."